A number of diseases have been reported and/or confirmed in corn samples from around the state. Weather conditions continue to be favorable for many diseases. Producers and consultants should monitor the severity of these and other diseases and their potential for impacting yield to assess the need for treatment. 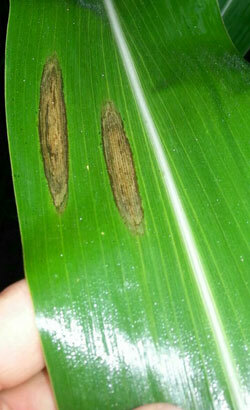 Northern corn leaf blight (NCLB) has been confirmed in several fields in eastern Nebraska. Warm humid weather favors infection by the fungus, Exserohilum turcicum, which causes this disease. Weather conditions, including cloudy days, moderate temperatures (64-81°F), high humidity and frequent rainfall will favor further infection and spread of this and other fungal pathogens that survive in infected corn residue from recent years. Figure 1. 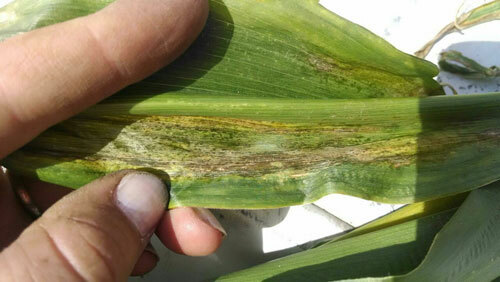 Northern corn leaf blight has developed in some eastern Nebraska fields (Photo by A. Nelson, Nelson Precision Agronomics). Like most other diseases caused by pathogens in plant residue, lesions may develop on the lower leaves first and continue to develop on leaves higher up the plant as long as conditions are favorable. NCLB tends to have larger, cigar-shaped lesions (Figure 1) with rounded ends. These lesions can be confused with Goss's bacterial blight lesions. Fungal spores may develop on NCLB lesions making them appear darker and/or dusty. Development and spread of NCLB prior to tasseling could reduce corn yield, particularly as lesions develop and expand, killing leaf area that's necessary for grain fill later. It is most important to protect leaves at the ear leaf and above that contribute the most to grain fill. In some fields, the disease has already reached leaves 4-6. With the early development of NCLB now, it may be necessary to apply a foliar fungicide to slow disease spread and protect uninfected leaf tissue in affected fields. Lesion development requires up to two weeks after infection occurs. Thus, it is possible that one to two leaves are already infected above the highest leaf on the plant that has recognizable lesions. To determine if a fungicide application is economical for you, consider the price of corn, yield potential, cost of treatment, and disease severity. Scout fields now and frequently to monitor for development of NCLB and other diseases. In fields currently affected by NCLB, it will be important to consider this disease in the future when making hybrid selections and other management decisions, especially crop rotation, tillage, etc. Figure 2. 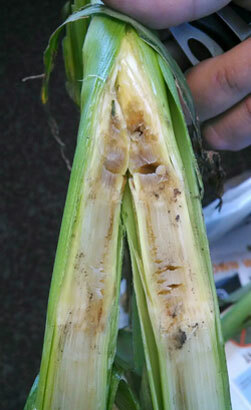 Goss's bacterial wilt and blight lesions observed in corn in Antelope County. (Photo by Central Valley Ag). Figure 3. Bacterial stalk rot also has been confirmed in corn affected by hail and may have a foul odor (Photo by Central Valley Ag). For more information see the UNL video, Corn Diseases: Northern Corn Leaf Blight (right) and the Purdue University publication, Diseases of Corn: Northern Corn Leaf Blight (BP-84-W). Bacterial diseases in corn continue to be confirmed and reported in fields around the state, especially in fields where corn was wounded during recent inclement weather. In particular, Goss's bacterial wilt and blight (Figure 2), bacterial stalk rot (Figure 3), and bacterial leaf streak have all been confirmed. Current moderate to warm weather conditions will continue to support spread and development of these diseases. Systemically infected plants often will be discolored inside the stems. Other symptoms on the leaves may appear somewhat different than the classic leaf blight symptoms usually observed with Goss's wilt, such as the dark freckles near the edges of lesions. Glossy exudate may be visible on the surface of leaves and is common in plants with Goss's wilt, but may occur with some other bacterial diseases, too. Since the pathogens causing these diseases are at least somewhat common in fields, it is possible for plants to have more than one disease. Unfortunately, there is no foliar treatment recommended for Goss's wilt or other bacterial diseases at this point. Since several diseases may appear similar, it is necessary to submit a sample(s) for diagnosis and confirmation. For help diagnosing a plant, submit a sample to the UNL Plant and Pest Diagnostic Clinic. For more information, please see the UNL NebGuide, Goss's Bacterial Wilt and Leaf Blight of Corn, and the related CropWatch video, Corn Diseases: Goss's Bacterial Wilt and Blight (right).